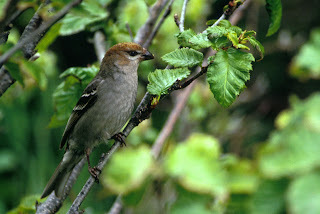 Stutchbury, who teaches biology at Toronto's York University, wrote "Silence of the Songbirds: How We Are Losing the World's Songbirds and What We Can Do to Save Them" (2007). San Francisco's picturesque skyline would be dark at night under a first-in-the-nation law proposed Tuesday that would mandate all skyscrapers turn off nonemergency lights after work hours. Board of Supervisors President Aaron Peskin said his measure would reduce the energy wasted in the city's downtown. "Anyone who has passed through our Financial District after dark knows that many large financial buildings in the downtown keep their lights on throughout the night even when there is not work or janitorial service going on," Peskin said. The proposed law says businesses that do not comply would receive fines. I'm not sure that's a good route, because it creates more bureaucracy to enforce the law. If, however, more skyscrapers turn off more lights between, say, 9 p.m. and 5 a.m. on the upper floors, then perhaps fewer migrating birds will die from collisions with skyscrapers or exhaustion. Consider this important? Do something. Birds migrating at night are strongly attracted to, or at least trapped by, sources of artificial light, particularly during periods of inclement weather. Approaching the lights of lighthouses, floodlit obstacles, ceilometers (light beams generally used at airports to determine the altitude of cloud cover), communication towers, or lighted tall buildings, they become vulnerable to collisions with the structures themselves. 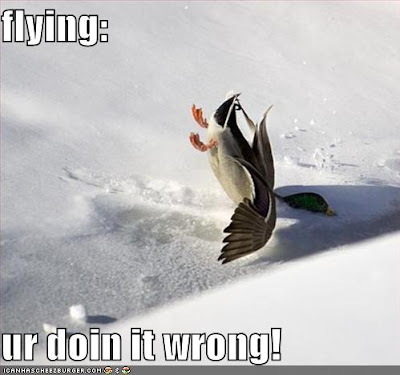 If collision is avoided, birds are still at risk of death or injury. Once inside a beam of light, birds are reluctant to fly out of the lighted area into the dark, and often continue to flap around in the beam of light until they drop to the ground with exhaustion. A secondary threat resulting from their aggregation at lighted structures is their increased vulnerability to predation. Also consider asking Audubon California and Golden Gate Audubon Society what they're doing, if anything, related to this proposal. The FLAP website doesn't show San Francisco as a city with a FLAP program; perhaps the site is outdated, and perhaps birders have taken the iniative to address the skyscrapers' effects on migrating birds. If they haven't taken that initiative, now's a good time. 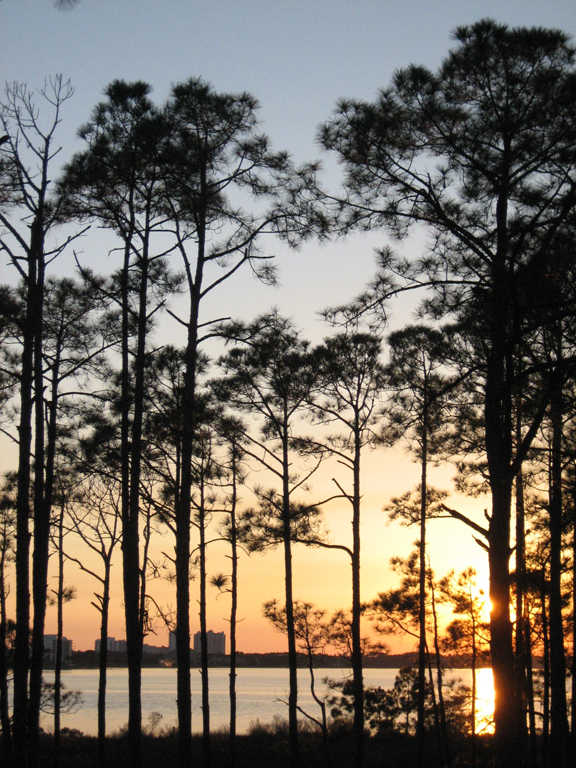 Want to support habitat conservation in the Lone Star State? With a state list of 632 species, Texas contains valuable habitat that hosts an incredible variety of birds. 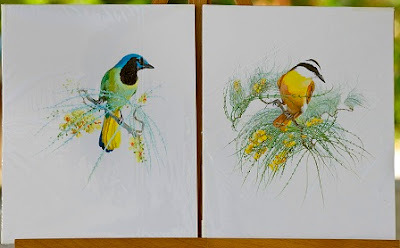 If you successfully bid on an item in the Great Texas Birding Classic's auction, you'll help birds such as Green Jays (below left) and Great Kiskadees. In fact, you can bid on the prints of these south Texas specialties, painted by artist Gerald Sneed, as well as many other items: books, artwork, software, a photography clinic, weekend getaways and optics. The online auction will close on May 2, and winners will receive word on May 5. "Jazz Aviary" offers birders and jazz enthusiasts a chance to appreciate sights and sounds that appeal to both groups. Suze Krebs will perform this Thursday, March 27, in Northridge and on Tuesday, April 1, in Culver City. Tickets cost $20 to $25, and a portion of the proceeds will go to the Los Angeles chapter of National Audubon Society. 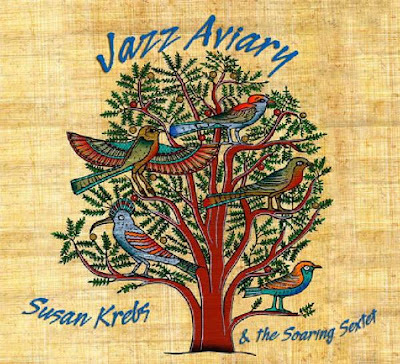 Los Angeles Times described Krebs' multimedia concerts with the Soaring Sextet as "a fascinating musical presentation," and LA Jazz Scene called it "one of the most refreshing, interesting, stimulating shows I've ever attended... Krebs and her amazing musicians created something of singular beauty." Between Feb. 15 and 18, birders submitted more than 85,700 checklists, identified 635 species and provided thousands of bird photos. The citizen scientists contributed to a database that ornithologists and other researchers can use to study species populations and distribution. For more details about the 2008 count, visit the highlights page on the Cornell Lab of Ornithology site. The lab and National Audubon Society organize the annual event, which will happen again Feb. 13-16, 2009. After revelling in the first day of spring, consider savoring the latest edition of I and the Bird, hosted by Clare of The House & Other Arctic Musings. Clare's created a wonderful roundup of blog posts, highlighted by pertinent quotes. I particularly like the Douglas Adams snippet. Aug. 28 marks the centennial of Roger Tory Peterson's birth in Jamestown, N.Y. If not for that event in 1908, who knows how long birders would've waited before an artistic, talented birder revolutionized the way that we identify birds in the field and at our feeders? To celebrate the centennial, the March/April issue of WildBird featured an article by Kenn Kaufman about Peterson's early years. In the May/June issue, readers can learn details about the creation and publication of the field guide that changed modern birding in 1934. For the July/August issue, WildBird wants to highlight birders' thoughts about Peterson's effect on this hobby/lifestyle/sport/passion. Please send an e-mail with RTP in the subject line. How did Peterson's work affect you? 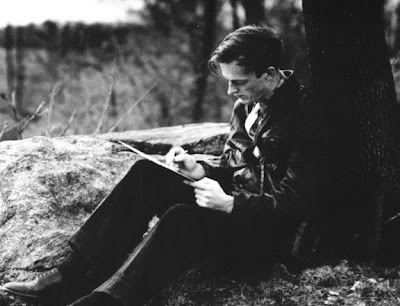 Did his books serve as your first field guides? How did his illustrations affect your opinions of field guides by other authors, photographers and illustrators? What thoughts or images does his name conjure? Please share your responses before Friday, April 18. On the Sunday closest to March 15, the town of Hinckley, Ohio, welcomes the return of Turkey Vultures to their region. This year's celebration took place yesterday at Buzzard Roost in Hinckley Reservation. Activities for TV aficionados included hikes, live music, bingo, items to purchase, storytelling, children's crafts and historical bus tours of Hinckley. 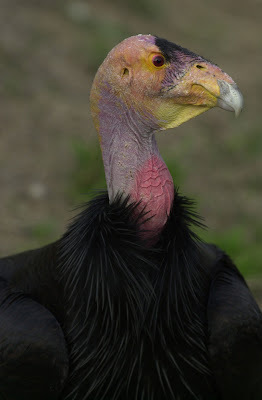 The Turkey Vulture Society provides a (somewhat dated) list of events that focus on Turkey Vultures, such as the Kern River Valley festival in late September. Have you attended one? Will you add buzzards to your travel schedule? In case you haven't read it already, here's the cover story of the March 2008 issue of "National Geographic." Virginia Morell's article discusses birds, such as Alex the renowned African Gray Parrot, New Caledonian Crows and Western Scrub-Jays. The really interesting piece also revealed that Betty, the New Caledonian Crow whom I cite when trying to convince Mom that crows are not bad noisy creatures, died recently from an infection. That news put a slight damper on my morning. Don't miss the related photo gallery -- which includes Uek, a New Caledonian Crow; Alex; and a Western Scrub-Jay named Psychobird -- and multiple videos. One video focuses on birds and bats. These birds of prey with the very specialized diet of apple snails are seeing more shoreline at East Lake Tohopekaliga and Lake Tohopekaliga. The South Florida Water Management District began lowering the lake levels in mid-February to slowly expose more vegetation for nesting, an earlier start date than in previous years. The district always lowers the lake levels to create storage capacity before hurricane season begins, but the district began working with the U.S. Fish & Wildlife Service two years ago to help the endangered Snail Kites. Years of National Geographic Traveler sit in my apartment's front room. I've enjoyed that magazine immensely. As for travel epiphanies... What I have instead is the comprehensive reinforcement of two beliefs I already held. First, although the cultural world undeniably has become more homogenized, the natural world endures, genuine and full of wonders, and it's here that travelers looking for diversity find the greatest rewards. There may be a Wal-Mart in Whitehorse, Yukon, and the same cable channels on televisions from the Bering Sea to Biscayne Bay, but anyone willing to get out of towns and cities can find proof of place in every park, preserve, and wildlife refuge. Flamingos do not nest on the tundra; spruce doesn't grow in the plains; pronghorn don't graze in the Deep South piney woods. People who lament the increasing sameness of the country are spending too much time in the mall. As I finished the article, it suddenly hit me. I met Mel White in Brinkley, Ark., two years ago. Holy cow. Last week's business trip put me in the Florida panhandle. The organizers of the North American Nature Photography Association's annual summit had invited me to review photographers' portfolios, so I joined the event at Sandestin Golf & Beach Resort east of Destin on Wednesday afternoon. In a resort setting, I didn't anticipate seeing much wildlife. The grounds, however, included many ponds -- large and small -- stocked with fish as well as large areas of long-leaf pine trees. The ponds, not surprisingly, attracted Brown Pelicans, Great Egrets, Double-crested Cormorants and Mallards. Walking from the conference center where the portfolios reviews took place toward my hotel room, I chanced upon a Belted Kingfisher and stood transfixed by his machine-gun call and nonstop movements. The next day, while sitting beside pine trees, I heard squeaky toys to my right. Yep, Brown-headed Nuthatches were foraging and provided good looks of the white spot on the back of their necks. 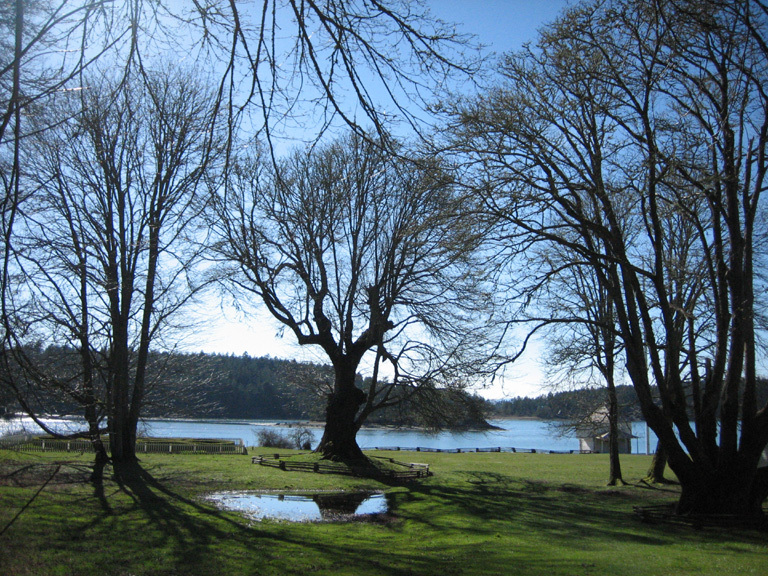 On my last day, I visited an island on the property at the recommendation of another birder. (Thanks, Ernie.) At the end of the footbridge, a Carolina Chickadee briefly perched to my right before dashing to the island's interior. What a treat.